Fog City Journal / Arts/Entertainment / Britain is repossessing the U.S.A.
Britain is repossessing the U.S.A. In light of your failure in recent years to nominate competent candidates for President of the USA and thus to govern yourselves, we hereby give notice of the revocation of your independence, effective immediately. Her Sovereign Majesty Queen Elizabeth II will resume monarchical duties over all states, commonwealths, and territories (except California , which she does not fancy). Your new Prime Minister, Gordon Brown, will appoint a Governor for America without the need for further elections. Congress and the Senate will be disbanded. A questionnaire may be circulated next year to determine whether any of you noticed. You should look up “revocation” in the Oxford English Dictionary. 1. Then look up aluminium, and check the pronunciation guide. You will be amazed at just how wrongly you have been pronouncing it. 2. The letter ‘U’ will be reinstated in words such as ‘colour’, ‘favour’ and ‘neighbour.’ Likewise, you will learn to spell ‘doughnut’ without skipping half the letters, and the suffix ‘-ize’ will be eliminated. Generally, you will be expected to raise your vocabulary to acceptable levels. (look up ‘vocabulary’). 5. You will learn to resolve personal issues without using guns, lawyers, or therapists. The fact that you need so many lawyers and therapists shows that you’re not adult enough to be independent. Guns should only be handled by adults. If you’re not adult enough to sort things out without suing someone or speaking to a therapist then you’re not grown up enough to handle a gun. 6. Therefore, you will no longer be allowed to own or carry anything more dangerous than a vegetable peeler. A permit will be required if you wish to carry a vegetable peeler in public. 7. All intersections will be replaced with roundabouts, and you will start driving on the left with immediate effect. At the same time, you will go metric with immediate effect and without the benefit of conversion tables. Both roundabouts and metrication will help you understand the British sense of humour . 8. The Former USA will adopt UK prices on petrol (which you have been calling gasoline)-roughly $6/US gallon. Get used to it. 9. You will learn to make real chips. Those things you call French fries are not real chips, and those things you insist on calling potato chips are properly called crisps. Real chips are thick cut, fried in animal fat, and dressed not with catsup but with vinegar. 10. The cold tasteless stuff you insist on calling beer is not actually beer at all. Henceforth, only proper British Bitter will be referred to as beer, and European brews of known and accepted provenance will be referred to as Lager. American brands will be referred to as Near-Frozen Gnat’s Urine, so that all can be sold without risk of further confusion. 11. Hollywood will be required occasionally to cast English actors as good guys. Hollywood will also be required to cast English actors to play English characters. Watching Andie Macdowell attempt English dialogue in Four Weddings and a Funeral was an experience akin to having one’s ears removed with a cheese grater. 12. You will cease playing American football. There is only one kind of proper football; you call it soccer. Those of you brave enough will, in time, be allowed to play rugby (which has some similarities to American football, but does not involve stopping for a rest every twenty seconds or wearing full kevlar body armour like a bunch of nancies). Don’t try Rugby the South Africans and Kiwis will thrash you, like they regularly thrash us. 13. Further, you will stop playing baseball. It is not reasonable to host an event called the World Series for a game which is not played outside of America . Since only 2.1% of you are aware that there is a world beyond your borders, your error is understandable. You will learn cricket deliveries. 14. You must tell us who killed JFK. It’s been driving us mad. 15. An internal revenue agent (i.e. tax collector) from Her Majesty’s Government will be with you shortly to ensure the acquisition of all monies due (backdated to 1776). 16. Daily Tea Time begins promptly at 4 pm with proper cups, with saucers, and never mugs, with high quality biscuits (cookies) and cakes; plus strawberries (with cream) when in season. Comments for Britain is repossessing the U.S.A.
to the citizens of the United States of America are now closed. This wasn’t written by John Cleese, nor does he want to take credit for it. Do your research and you might actually succeed as a legitimate publication. Bravo! Brilliant! Please don’t leave us for the UK…we need you in California. Will everyone PLEASE stop spreading around idiocy?! Therapists??? 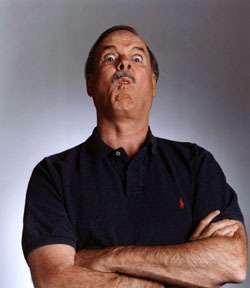 John Cleese is confusing us with Argentina.